18 Mar Earn Number of the Beast Eddie! Battle in the Hell and Fire Dungeon NOW! Number of the Beast Eddie is making his Legacy of the Beast debut in a limited-time Dungeon! Collect Hellfire Souls for an EXCLUSIVE chance to pull this 5⭐Warrior! 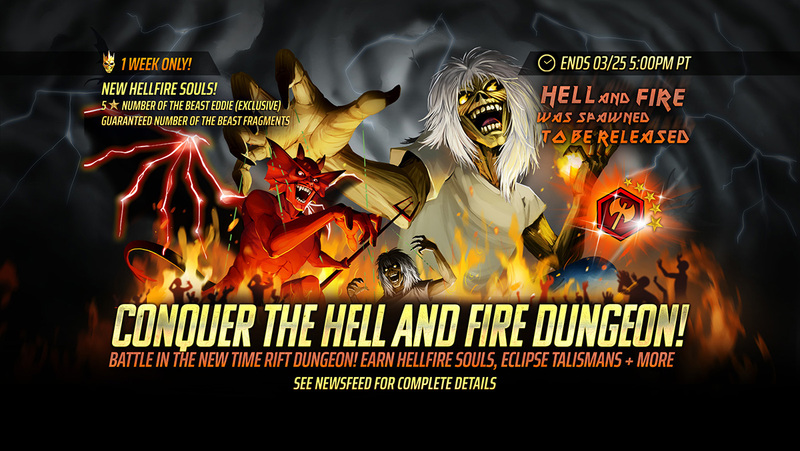 From March 18th until March 25th at 5PM PT, battle in a limited time Dungeon for Hellfire Souls, Warrior Soul Fragments and Eclipse Talismans! The Hellfire Soul is a limited time event soul which guarantees a 3⭐ to 5⭐character of any class, with an exclusive chance of getting Number of the Beast Eddie! Number of the Beast Eddie is a formidable opponent who applies negative effects to multiple targets, and gains offensive effects if enemies are below half health! His Fury removes Immunity and Beneficial Effects from the enemy and increases random Stats on each ally for every beneficial effect that is removed.